March 1861 to May of 1863. Although less well known than the "Confederate Battle Flags",the Stars and Bars was used as the official flag of the Confederacy from March 1861 to May of 1863. The pattern and colors of this flag did not distinguish it sharply from the Stars and Stripes of the Union. Consequently, considerable confusion was caused on the battlefield. aka as "The Stainless Banner." It's also the same flag that was explicitly designed to symbolize "heaven ordained supremacy." 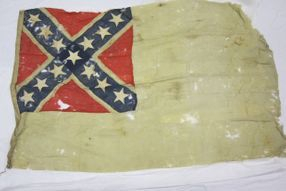 Syracuse University historian Jonathan Wilson, who studies antebellum American literature, tracked down the meaning of the second Confederate flag as described by its designer, Thompson. On March 4th,1865, a short time before the collapse of the Confederacy, a third pattern was adapted; a broad bar of red was placed on the fly end of the white field.